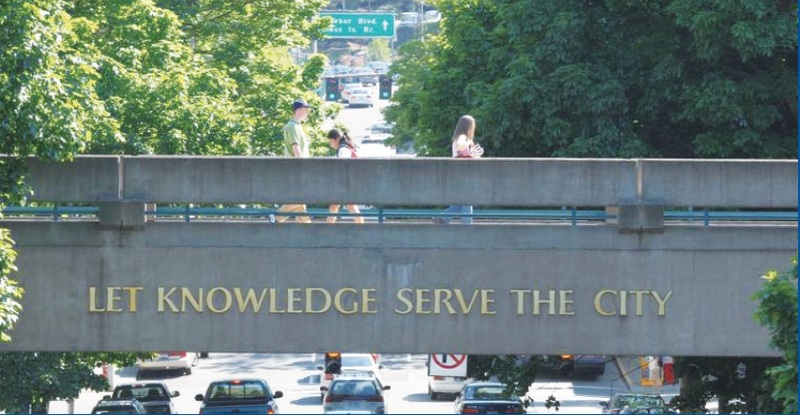 ▲ "Let Knowledge Serve the City" is a motto of Portland University of USA. However, it is doubtful whether the reality says the same thing. On Land Nordrhein Westfalen of 2009, more than 100,000 angry German university students left their classrooms to the streets. Strikes of a giant scale were repeatedly held for over a month, until the government repealed its decision to “collect tuition fees.” Behind the outrage of German students lay German strong belief that higher education should be considered as a public good, and a part of public welfare. The phrase “public good” has the implicit meaning that the government pays the costs for the good since the whole public benefits from it. In Korea, attempts have also been made to put the nation’s university education under the same category as Germany’s, such as the strike on the government halved tuition fee in 2011. Park Geun-hye administration, which took presidency in 2012, pledged to halve tuition fees by 2014. However, the promise ended up in vain along with the countless politicians’ identical claims that preceded it. Such tenacious attempts and failures to deliver public university education raises doubts on whether higher education in Korea should actually be considered as a public good. The status quo in Korea deems higher education, such as university or college education, as a private good. In fact, the price that Korean university students should pay to continue their study is higher than most of the nations in OECD. According to the statistics by Daehakalimi, the average tuition fee that Korean university students pay is 7,600,000 Won per year, which in terms of cost is second place in the international ranking following the United States. The main reason behind the high university tuition fee in Korea is that university education is not considered to be something that will benefit the public. Instead, it is only thought of as a merit to an individualʼs career. This viewpoint has led Korean universities to disregard public sentiments, causing skyrocketing tuition fees. “Korean has the American perspective that higher education benefits individual learners, not the nation as a whole. With this thought in mind, attending and paying for universities is an issue of personal choice,” said Oh Sung-sam, a Professor in the Department of Educational Technology at Konkuk University. The current Korean university students get little or no support from the government in paying their tuition fees. In fact, there is substantial social pressure that forces individuals to attend university in Korea. According to Korean Educational Statistics Service, 75 percent of all Korean high school graduates move on to receive higher education, which is the highest rate among those of all OECD nations. “The percentage of people who attend university soars high in Korea. In this nation where elementary schools and universities have similar numbers of students, it is somewhat an irony that paying tuition fees is a personal matter while primary education is supported by the government as a public good,” said Lim. Some claim that unsupported higher education leads to unemployment. Park Ja-eun, a Former President of General Student Council of Sookmyung Women’s University said, “The tuition fees of Korean universities are pricey, even from an objective point of view. A considerable number of students take out loans from the government to continue studying, even though they are not from the low income group.” The problem is that it is not as easy to pay back the loan as it is to take it out. According to the statistics by Korea Student Aid Foundation, about 3,700 university students were taken into legal action because they failed to repay the loan in time. “There is a saying that every one in four young men is jobless. Relying on student loans brings that sad story to life,” said Lee, stressing the need for a general government aid in order to prevent a public credit crisis. Some claim that using government tax to deal with all university students’ financial problems does not bring benefits to the public. Their main argument is that making college education a public good is an incomplete solution to the current problems. Instead, they claim that it would worsen them by increasing the already sky-high university entrance rate in Korea. 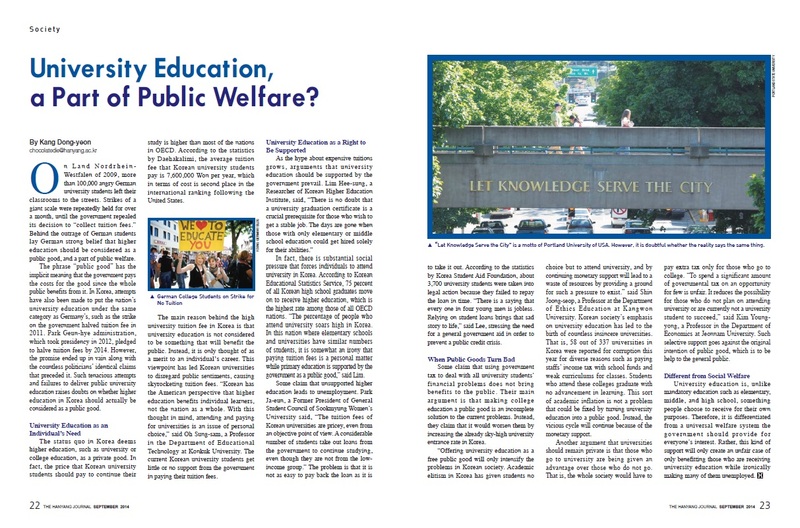 "Offering university education as a free public good will only intensify the problems in Korean society. Academic elitism in Korea has given students no choice but to attend university, and by continuing monetary support will lead to a waste of resources by providing a ground for such a pressure to exist.” said Shin Joong-seop, a Professor at the Department of Ethics Education at Kangwon University. Korean society’s emphasis on university education has led to the birth of countless insincere universities. That is, 58 out of 337 universities in Korea were reported for corruption this year for diverse reasons such as paying staffs’ income tax with school funds and weak curriculums for classes. Students who attend these colleges graduate with no advancement in learning. This sort of academic inflation is not a problem that could be fixed by turning university education into a public good. Instead, the vicious cycle will continue because of the monetary support. Another argument that universities should remain private is that those who go to university are being given an advantage over those who do not go. That is, the whole society would have to pay extra tax only for those who go to college. “To spend a significant amount of governmental tax on an opportunity for few is unfair. It reduces the possibility for those who do not plan on attending university or are currently not a university student to succeed,” said Kim Youngyong, a Professor in the Department of Economics at Jeonnam University. Such selective support goes against the original intention of public good, which is to be help to the general public. University education is, unlike mandatory education such as elementary, middle, and high school, something people choose to receive for their own purposes. Therefore, it is differentiated from a universal welfare system the government should provide for everyone’s interest. Rather, this kind of support will only create an unfair case of only benefitting those who are receiving university education while ironically making many of them unemployed.